If any year could be considered the most noteworthy for gaming, 1996 certainly has to be among the highest ranked. Several long-running series, many of which are still going strong today, debuted in ’96. Tomb Raider, Crash Bandicoot and Pokémon all started out in this year, and another debuting series was Resident Evil. 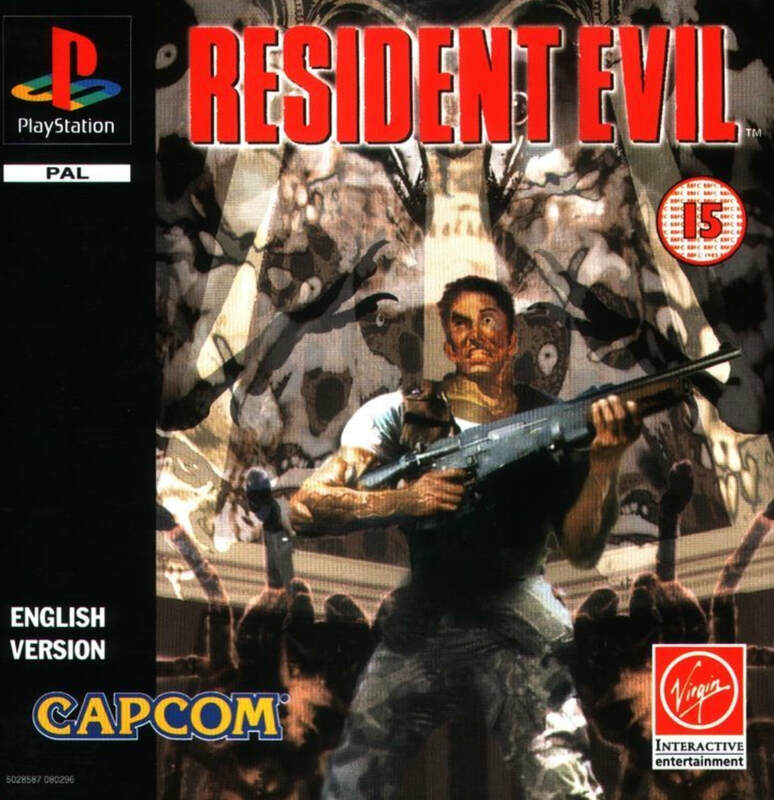 Beginning life as a remake of a movie tie-in which never saw life outside of Japan, Resident Evil marked the beginning of survival horror as a mainstream, definitive genre across the PlayStation and although some of the localisation was botched entirely, the game is an intense, macabre and meticulously designed masterpiece. Taking the role of either Chris Redfield or Jill Valentine, a series of cannibalistic murders on the outskirts of Raccoon City force the RCPD to send in special unit STARS to investigate. As Bravo’s comms go dark, Alpha team – including Chris and Jill – follow the trail until deadly dogs maul a team member and force the remaining members of Bravo to flee into a mansion. Now, it’s up to either Chris or Jill (depending on who you pick) to explore the mansion and discover the truth behind these murders and dangerous beasts. What unfolds is a brilliantly laid out horror masterpiece. Everything takes place in this abandoned mansion, designed to constantly provide new blockades for you to overcome. It’s not so much that it’s just a technically advanced setting (for 1996 it was visually sumptuous, though) but that it’s like the videogame equivalent of a rubix cube, as you satisfyingly slot the path into place. It may instigate some backtracking, but as you begin to track down the keys, jewels and plaques to open up more of the mansion – eventually opening an entirely new subsection with its own distinct, suffocating atmosphere – this becomes a nonissue. Although Alone in the Dark would pioneer survival horror, Resident Evil arguably perfected it. One source of contention has always been the controls, but arguably they ratchet up the tension further. Navigating around the mansion utilises tank controls, with horizontal movement swerving your character around and vertical pushing you forward and backward. Shooting isn’t straightforward either, forcing you to remain still while aiming. It creates a feeling of unease, because you often find yourself scrambling to attack. Jill and Chris can run away, but merely getting yourself in a position to move can be tricky. Yet it’s this system of controls which keeps everything tense, as a smoother sense of movement would arguably have reduced the urgency to shooting and moving, especially when faced with tougher bosses. Juggling keys, important puzzle items and supplies to keep you alive becomes the name of the game, with Jill limited to eight items and Chris just six. Even the act of saving requires careful thought, as you must utilise Ink Ribbons to activate save points – no ink ribbons, no saving, increasing the chance of losing substantial progress. But ammo, healing items and ribbons are all a scarce commodity, turning Resident Evil into a tense, thoughtful action game where every action has consequences. It can be punishing, as a bout of confidence can result in losing your progress. But it adds a great layer of tension, resulting in rewarding gameplay once you pass the tougher sections. 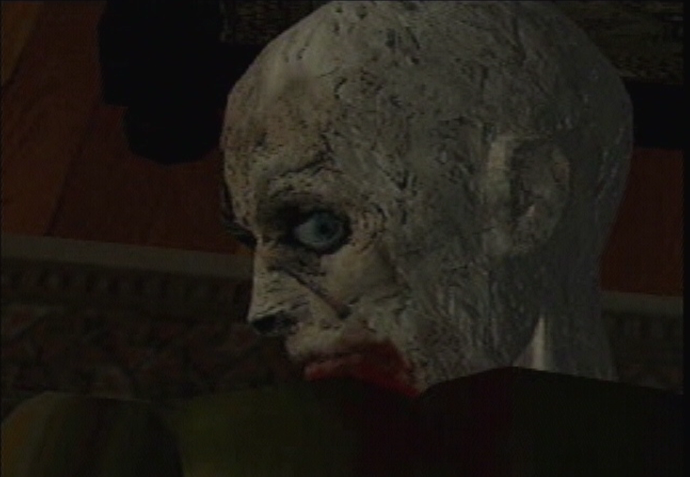 Of course, being a horror game, Resident Evil wouldn’t be complete without some gruesome foes to confront, and there’s a bevy of them. 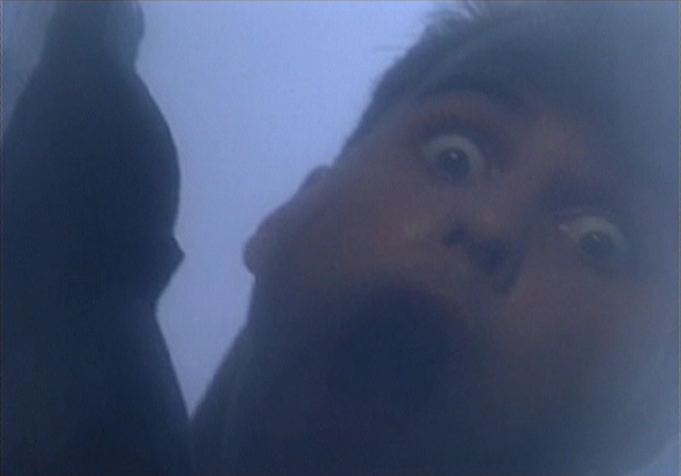 The first encounter with a zombie, as it cannibalises a member of STARS, is haunting, but their shambling movements and gruesome decapitations help them remain in your mind longer. As you progress, more nasties rear their ugly head. Vicious Cerberus dogs, the first of which is involved in one of gaming’s greatest jump scares, can run literal circles around you. Spiders will make your skin crawl, Hunters can decapitate you without mercy and some late-game foes are just as creepy to behold. Caught red-handed! Or red-faced. Redddd. Nom-nom. It’s rich with gameplay too. As mentioned, RE let’s you choose between two characters and these result in differing experiences, if narratively similar. Jill serves as a perfect starting point, as not only does she have a bigger inventory and a lockpick – reducing the need to search for keys - but benefits often from assistance from Barry, avoiding scenarios which would kill or endanger Chris. On the other hand, Chris’s reduced inventory, inability to play piano and lack of a lockpick is compensated with more health, though monsters also take more damage so it definitely comes off as a harder mode, as there is a deeper focus on backtracking and managing your inventory. Bonuses are unlocked too, as earning certain endings and completing the game in speedy fashion brings infinite ammo mods and costumes. Your first playthrough will likely last just shy of the 10 hour mark, but you can spend much longer exploring this mansion to all it’s worth. It’s also a presentation powerhouse. Resident Evil relies on pre-rendered backgrounds to showcase a mansion seeping with dread, and they are rather impressive looking, making the 3D objects and characters stand out. 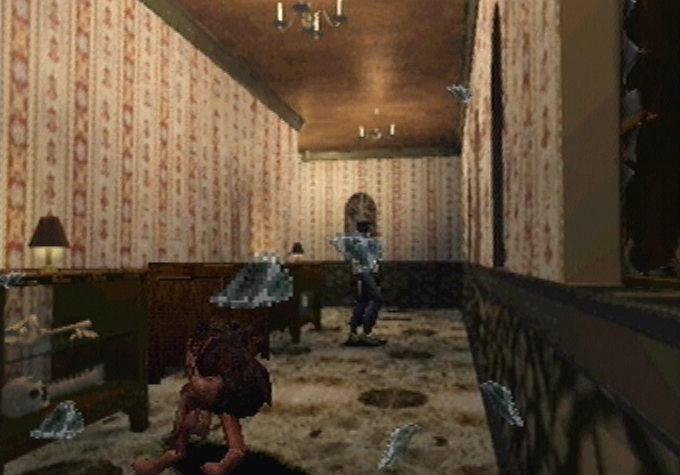 Cut-scenes show impressive animation and expression, while the shambling zombies, skin-crawling spider movement and agitated dogs are some of the most frightening monsters to crawl out of the PS. There’s also great use of static camera angles, sometimes obscuring enemies from your sight until they are taking chunks out of you, making you fear every corner. The atmospheric music combines with some sickening sound effects to add to this horror, the only tension-breaker being the unintentionally hilarious voice acting that, frankly, is so terrible it’s incredible. Iconic moments – maybe involving a “Jill Sandwich” – produce genuine gut laughs, making it all the more amazing how well it still scares. Tense, frightening and rewarding to explore, Resident Evil remains atop the pile as one of the best games to grace the original PlayStation. The meticulously designed mansion, gruesome array of monsters and timelessly replayable gameplay mean Capcom’s first journey into survival horror still remains one of the best. For those curious about the roots of this long running franchise, or for those looking to be simultaneously enthralled and terrified, this all-time classic is simply a must-play. "ammo, healing items and ribbons are all a scarce commodity, turning Resident Evil into a tense, thoughtful action game where every action has consequences... [it] remains atop the pile as one of the best games to grace the original PlayStation."